submit is proposed as a device of real-time differential-amplification of a possible body in a specific physical place, and as a mixed system of representation and instantiation of it. The relationship body/information can be understood as an operation where both parameters exclude each other and, therefore, requiring mediation. That relationship can only be established meanwhile the first is informmed, that is, by cut/register process as diferential operations of decodification/codification. If every system of representation is based on the systematization of an arbitrariness where the systems of codification and decodification are congruent, then this only can be possible if the relationship with the referent is extensible and applicable over other referents. As such, the representation of an object do not guarantee the existance of a referent, and only proves the existance of this system. Every information object is potentially instantiable, that is, it can be accessed from multiple terminals. An object is instanciable only in case that becames a diagram/code segment of/refered to itself, susceptible of be decoded/constructed. However the relationship of an object and its instance isn't reciprocal, instead it behaves only in a referencial way, from the instance to it. In this sense, we could understand that an information object is accessible only in a double condition of reference and multiplicity. submit:!body (nobdy), is established in the connection of both physical and virtual spaces by infrared sensors and a database. 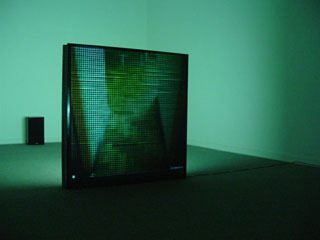 Instead of a physical installation, !body consists of an intervention of the author's house by sensors; in this way his body is shifted to a fixed field of action (the place, his house, his home) that is displayed on the web; thus, from internet, the common space of the analitic reduction of the body-place-author is inhabited, his representation in this space is interfered, becoming body while occupying a space where both (the author's body, the user's body) share the same substrate: information. The hardware device of !body interfers the intimacy of the author, and all the violence of this gesture is condensed to its minimal expression. All the information that could be provided to the user is reduced to one byte (a decimal value between 0 and 255) that is returned by the physical device. A whole system of representation and visualisation is developed from this unit. 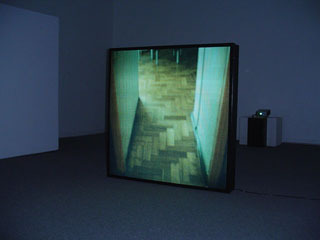 Static information -as the house plains or photographic images of it- is given to the user on the web, and is "operated" by the dynamic real-body-referenced data inputs. In this way, the reconstruction of the body, from his daily behavior, does not only takes place in a concrete information layer but also in a speculative field opened by the arbitrary but systematic use of analogic representation systems. thu-sat: 12-21 hrs. / sun: 11-17 hrs.